Protect your PC from malicious threats from malware, spyware, ransomware, trojans, keyloggers, and more. Pro Edition benefits: real-time threat blocking, automatic database updates, scheduled scanning, and email notifications. Additional product screen shots available here. 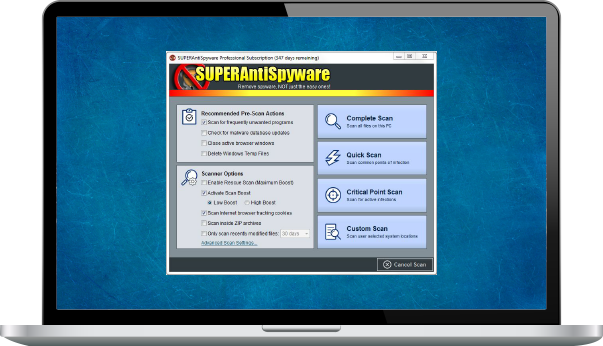 Scans & Blocks Threats in Real-Time: Stops potentially harmful software from installing. Examines critical points of your system each time you start up or shut down. Get alerts when new programs are added. Updates Automatically: Never miss an update. Always have the latest database definitions so you have the most up-to-date protection. Enables Flexible Scanning Options: Schedule either quick, complete, or critical scans to fit your schedule. Sends Email Notifications: Get emails with scan results so you can monitor PCs remotely. Proprietary Definitions Database & Daily Updates A dedicated threat research team scours the web and analyzes thousands of possible threats, focusing on the hard-to-find ones. The database is updated 2-4 times a day. Multi-Dimensional Scanning A next-generation scanning system that goes beyond the typical rules-based methods. It detects existing threats and analyzes general characteristics and code patterns to identify future threats. Process Interrogation TechnologyOur unique Process Interrogation Technology (PIT) detects hard-to-find threats like rootkits and kernel drivers, usually missed by standard anti-spyware applications.